Civilians who escaped from Raqqa, an Islamic State stronghold in Syria, have told RT about the horrors they faced during an airstrike by the US-led coalition, which they say “directly targeted” their homes while children were outside. The witnesses told RT’s Ruptly video news agency that they believed coalition forces were aware that there were no insurgents in the area, as what they think was a coalition aircraft had filmed them hours before the strike. The aircraft targeted the civilian houses while children were playing in the streets, one man said. “We were directly targeted by the coalition after their reconnaissance craft filmed us, it was at a low altitude,” an eyewitness told Ruptly at Al-Qamishli National hospital in Hasaka on Tuesday. A child with a head wound is seen in the footage. Another Raqqa resident questioned the alleged use of white phosphorus in the city’s Faros neighborhood and nearby areas. In June, Amnesty International warned the US-led coalition against the use of white phosphorus near civilians as this is against international law. “It has been said that the coalition used white phosphorus in the Faros neighborhood of Raqqa. It was the aircraft. Who else would do that? It should be the aircraft. It targeted a civilian neighborhood and the close-by areas,” he said. At least 78 civilians were killed in Raqqa as a result of US-led coalition airstrikes over the past 24 hours, Syrian news agency SANA reported on Tuesday, citing local and media sources. “Our humanitarian colleagues tell us they are deeply concerned by unconfirmed reports of a high number of civilians killed by an airstrike in Raqqa city over the last 24 hours,” Dujarric said. The UN Office for the Coordination of Humanitarian Affairs (OCHA) also condemned the actions of the coalition that resulted in civilian casualties. Meanwhile, a large number of the Islamic State terrorists (IS, formerly ISIS/ISIL) in Raqqa have left to join the final battle for the besieged city of Deir ez-Zor, according to the Russian military. 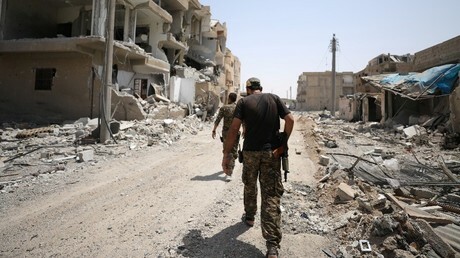 Raqqa has been under siege for three months, but the mostly Kurdish Syrian Democratic Forces (SDF), backed by the US-led coalition, have not yet captured it. Civilian casualties have been frequently reported since the beginning of the assault. A UN report says at least 300 civilians were killed in Raqqa in the three months since March, as cited by Reuters. “They are not taking responsibility for the true scale of civilian casualties,” Nicolas Davies, author of ‘Blood on our Hands,’ about the invasion of Iraq, told RT.